Choosing floors is hard. Choosing some floors is harder than choosing others. Basement floors are famous for being the problematic of the lot. Being well below the ground moisture poses a real problem/danger for them, as do concrete slabs that make it hard for wood floors to be set up properly. In the past, all of the above had a hefty influence and used to narrow down the basement flooring choices to mostly manmade synthetic materials. However, thanks to modern inventions and technological progress today it’s possible to install pretty much every kind of floor in your basement. So how do you pick one? No worries, we’ve got you covered. 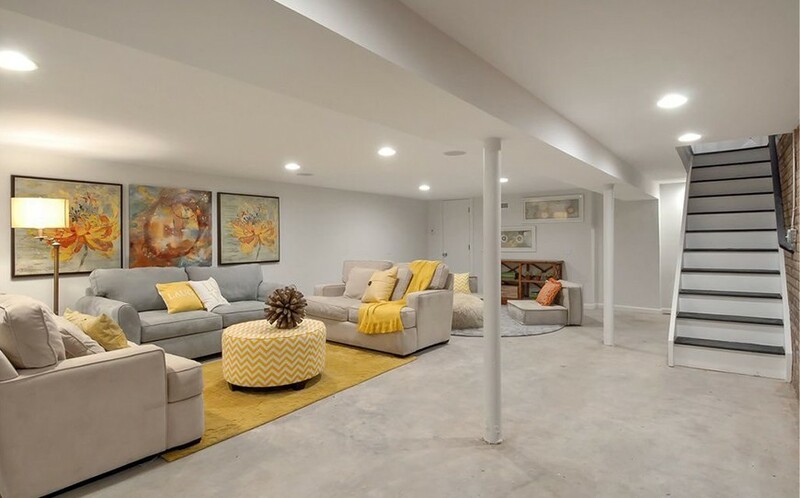 Before moving on to the actual to the actual floor selection process, it’s important to determine the purpose of your basement. A simple storage room has a very different aesthetical need than a basement cinema. Deciding early on the function of your basement will make it easier to narrow down and will save you some money. Use it, it’s already there! There is a very high chance that the subfloor in your basement is made out of concrete. Concrete, once considered ugly and cold, has been gaining popularity as a mean of decor. The plain concrete surfaces in the room make the more warm materials present in the house stand out beautifully. So instead of paying extra for a new floor, consider turning your concrete subfloor into one. A good cleaning and maybe grinding down some rough spots will do it. If you are looking for a better look, try acid staining. Unlike paint, acid-staining is permanent and just looks better. For an even more sophisticated look, you can have a concrete slab polished and sealed. Vinyl is probably the fittest material to be installed in a basement. It’s water resistant and even though it’s synthetic, it can realistically mimic most natural flooring materials including wood and tile. Most vinyl floors are designed to go right over concrete, they come either in sheets or in tiles for easier installation. Vinyl floors can be laid out in one of the two ways, glued down or “floated”. Floating is a flooring installation method used in especially humid environments. When using the floating method there is enough space for a moisture barrier to be installed over the concrete slab of the basement for a better protection against any moisture. However, vinyl isn’t the only “floating floor”. The same approach can be used with most engineered floors. Tile has been the go to floor for kitchen and bathroom forever, so it’s water resistant abilities are no secret. It can endure floods and all kinds of abuse, does not require a subfloor and is easier to clean. You can choose from numerous designs, patterns and makes (glazed for a more budget oriented basement transformation and porcelain for a richer look). The only setback? It will most likely add to the lack of heat that is common to a basement. So you might want to consider some heating options if you are planning to spend a lot of time in your basement. We know what you are thinking, wood and humidity don’t seem like the best of combinations. But it’s not just wood we are talking about, it’s engineered wood. Engineered wood is a stronger and bolder take on the traditional solid hardwood floors that is just as beautiful as the original. Thanks to its cross-ply structure an engineered hardwood board is 80% less likely to get affected by moisture, meaning that the chance of warping is an all time low among wooden floors. Typically, hardwood isn’t seen as a suitable flooring option not only because of its bad water resistance but also because of installation related difficulties. However, this is only true for solid hardwood floors that require a wooden subfloor to be stapled down onto. The backing layer of engineered hardwood board can be glued straight to your concrete subfloor without much difficulty. Laminate is probably the material most people wouldn’t even consider when they are thinking about remodelling their basement. And they would be right. Regular laminate flooring wouldn’t have a long life 8 feet under the ground. But we aren’t talking regular laminate, we are talking waterproof laminate. The trick is to fully eradicate any moisture related dangers before the laminate flooring is installed. This is achieved by the same ‘floating’ method we have discussed earlier and involves a waterproof barrier between the concrete subfloor and the laminate floor. For really humid basements we would still advise using melamine infused laminate flooring. Melamine is a moisture-resistant chemical that is mixed into the high-density fiberboard, making the laminate extra waterproof. If you want to go for a warmer feeling floor that is better at keeping out moisture than a carpet and less pricey than engineered hardwood, this and vinyl are your two best options. Whatever floor you decide for for your basement, please keep in mind that right maintenance is half of the deal. Keep your basement as dry as possible and regularly inspect the premises of your house to avoid any accidental leakages.